But you can’t write casually about the Sazerac. The history of the cocktail is complex and much debated, “so intricate and entangled in myth,” writes David Wondrich in Imbibe!, “it requires a monograph of its own.” Wondrich reached page sixteen of his Sazerac treatise before his editor made him stop, and if this historian-come-cocktail authority won’t try for encyclopedic in his coverage of Sazerac, neither will we. However, we can guide you to a few fun sources that sketch the lore of the Sazerac. Below are a few facets of the Sazerac myth which may or may not be true, but should absolutely be embellished to provide the most exciting story possible. As Wondrich’s research reveals, written record of that elusive noun, “cocktail” appears as early as 1803 in a tiny little newspaper produced in a tiny little town called Amherst, New Hampshire (which is coincidentally, where I grew up.) The debate goes on and on, but the nomenclature and the execution of such a drink with such a name likely predate Peychaud’s home tippling. The Sazerac was originally served in an egg cup. 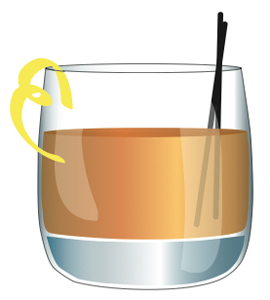 On The Gumbo Pages, Chuck Taggart provides an excellent overview of the history of the Sazerac. Here we learn that Creole apothecary Antoine Amadie Peychaud moved to NOLA in the early 1800s, set up shop in the French Quarter, and began selling his signature tincture to “relieve the ails of all his clients.” After hours Peychaud mixed that magic tincture with a little cognac, water, and sugar for his friends. He served the drink in the large end of an egg cup — a coquetier en Francais — and the improper American pronunciation of this term led to the eventual appellation “cocktail”. In that version of the myth, the Sazerac is thus the original cocktail, Peychaud its father, and New Orleans its cradle. It’s as likely as landing a dinner meeting with the Easter bunny, but a good tale nonetheless. The Sazerac became the Sazerac at the Sazerac Coffee House on Royal Street. Sewell Taylor christened the “Sazerac Cocktail” as the signature drink of his Sazerac Coffee House on Exchange alley in 1853 . The drink was to be made only with Sazerac de Forge et Fils brandy, a popular brand of cognac of which he was the sole importer. Or was it John Schiller who opened the Sazerac Coffee House in 1859, and christened the Sazerac Cocktail its signature drink to be made with Sazerac brand cognac, for which he was the sole importer? 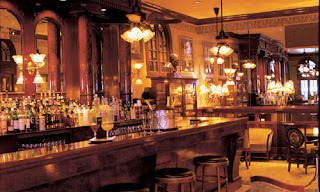 In any case, it was at the Sazerac Coffee House that an innovative barkeep introduced the step of rinsing a glass with absinthe, and it was here, under new owner Thomas H. Handy (or was it John Handy, as cited in The Craft of the Cocktail?) that the principal spirit was changed from cognac to rye whiskey, circa 1870. Reasons for that switch are clear, at least: the phylloxera epidemic in France made cognac hard to come by…or was it simply that the American palate favored rye? Maybe it was a little of both. Sazerac de Forge et Fils perished in the 1880s, but as one brand dies, another is born: a decade later the Sazerac bar had grown into a Sazerac company who began to bottle and sell the rye-based version of the drink. That same company sells a six-year-old Sazerac brand rye today, as well as many other spirits. Oh, what a tangled web history becomes when its scribes hit the bottlet! The beauty of these modern times is that all of these ingredients (save the Sazerac de Forge et Fils cognac) are available today — event absinthe! We suggest experimenting with the ingredients, ratios, and recipes you like the best, and matching it to your favorite foggy detailed story while mixing one up to impress your friends. Here are a few variations to get you started. Frappe [chill] an old-fashioned flat bar-glass; then take a mixing glass and muddle half a cube of sugar with a little water; add some ice, a jigger of good whiskey, two dashes of Peychaud bitters, and a piece of twisted lemon peel; stir well until cold, then throw the ice out of the bar-glass, dash several drops of Absinthe into the same, and rinse well with the Absinthe. Now strain the Cocktail into frozen glass, and serve with ice water on the side. A free copy of the LITTLE BLACK BOOK OF COCKTAILS goes to the first reader to try this with a good cognac and an egg cup and report back with pictures! Chill one rocks glass while preparing the drink in another. Splash the Ricard into another glass and swirl it, then pour it out. Add the cognac, rye, simple syrup, and the two kinds of bitters. Stir with ice cubes to chill. Strain into the chilled rocks glass and garnish with lemon peel. This modern recipe calls for both Peychaud’s & Angostura bitters in uneven ratios, Herbsaint, the local pastis that served as absinthe’s understudy during the ban, and shaking, not stirring, the ingredients. Makes 1 cocktail. Pour the Herbsaint into a rocks glass and swirl to coat the inside. Discard any excess Herbsaint. Fill the glass with ice to chill. Combine the rye, simple syrup and Peychaud’s and Angostura bitters in a cocktail shaker with ice. Cover and shake vigorously. Discard the ice from the glass and strain the shaker mixture into the glass. Rub the rim of the glass with the lemon twist, add to the drink and serve immediately. Enjoy your Sazerac, and Happy Tales to you! It’s Mixology Monday again! This month we are, with our host Jimmy’s Cocktail Hour, exploring Variations. Here in Boston the ladies of LUPEC have been very excited with the recent availability of the Rothman and Winter Creme de Violette. It’s always thrilling to have a new product available, but in this case this is a new old product which opens up yet another window into cocktail past. In honor of our new favorite spirit we are going to take a look at three cocktails featuring gin, creme de violette, absinthe and french vermouth. Within my modest collection of cocktail tomes I found the first recipe for the Atty Cocktail in The Savoy Cocktail Book. Thumbing through Patrick Gavin Duffy’s Official Mixer’s Manual we find the Attention Cocktail. Once again, all things we love, but equal parts doesn’t really work for us. The strength of the Absinthe overpowers the other ingredients. Ah…we’re getting closer. The increase in the base spirit created a nice platform for the other flavors. Truth be told, we used Ricard instead of Pernod…desperate times call for desperate measures. The Ricard still was a bit powerful, but seemed to complement the Creme de Violette rather than battle it as was the case with Absinthe. Sticking with Mr Jones we find the Arsenic and Old Lace. From the name alone we have very high hopes! Once again we used Ricard and it was good, but we miss the bitters. So in conclusion, there is no conclusion. As women dedicated to our cause we will happily continue our research! Oh my goodness! I almost forgot two very important things! A huge shout out to Eric Seed, the man behind the availability of Creme de Violette. Besides having the cutest daughter in the world who claps when she eats head cheese, through Haus Alpenz he is making amazing products available to us! Please check out his website and encourage your local retailers and bars to carry his products. For an updated variation on the Arsenic and Old Lace head over to this post on Cocktail Chronicles where Paul Clarke checks out Simon Difford’s Flower Power Martini. Born in 1849 in Pearlington along the Mississippi River, Eliza Jane Poitevent became the first woman owner and publisher of a major daily newspaper in the United States, the New Orleans Times-Picayune. Eliza began her career as a poet under the pen name Pearl Rivers. In 1870 she was offered the position as literary editor at the Picayune. Against the wishes of her family she moved to New Orleans and joined the male work force as the first woman in Louisiana to make a living at a newspaper. Two years later Eliza married Col Alva Morris Holbrook, the owner and publisher of the Times Picayune. In 1876 Holbrook died, leaving the paper $80,000 in debt. Eliza’s family encouraged her to declare bankruptcy, but Eliza persevered and at the age of 27 she became the editor and publisher of the Times Picayune. Although some of the staff left, the majority remained at the paper showing their loyalty to Eliza. Under her management the Picayune evolved into a family paper which included departments for women, children, fashion and household hints. As a philanthropist, Eliza used the editorial page to speak out against cruelty to animals. Eliza incorporated elements of the modern syndicated newspaper, thereby tripling the circulation of the Times Picayune from 1880 to 1890. And now a toast to Pearl Rivers! Stir in a glass with ice. Strain into a chilled cocktail glass in which has been placed a maraschino cherry.